Synthetic dyes, especially azo dyes, have come under increased scrutiny by regulatory agencies because certain precursors used in their manufacture were shown to pose a risk to human health and the environment. This led to the need to understand the relationships between azo dye structures and their genotoxic and ecotoxic potential. Our work in this area started in 1984 with funding from IBM, whose corporate interest was to generate results that could be used as a basis for knowing which dyes to avoid in commercial products, such as ink-jet printers, but our group saw an opportunity to use the same results to design safe alternatives to important dyes being eliminated from commerce because of their potential to undergo metabolism to produce carcinogenic arylamines such as benzidine (cf. 3, Fig. 2). 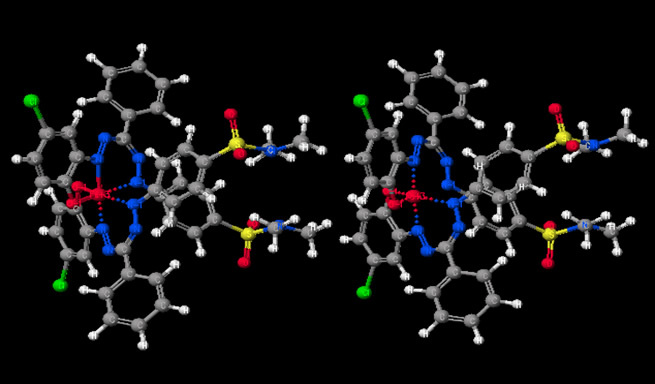 This idea enabled the design of non-genotoxic aromatic amine precursors (e.g. 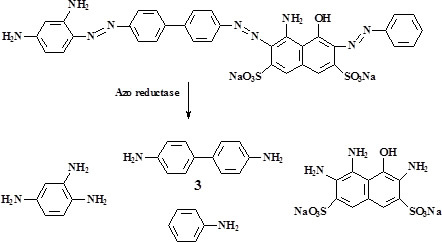 4-6) for azo dye and pigment synthesis and the use of the derivative colorants for textile and non-textile coloration. Fig. 2. Metabolic cleavage of an azo dye to the corresponding arylamines. Funding from the National Textile Center and Clariant Chemicals has permitted the design of metal complexed dyes for polyamide and protein fibers that would be devoid of the toxicity concerns associated with certain effluents from dye manufacture and textile dyeing operations. The main goal was to protect ecosystems associated with either drinking water or aquatic life (plants and animals). While the presence of chromium (Cr) and cobalt (Co) ions in textile dyes was deemed critical to producing photostable dyes for carpet fibers, the presence of free Cr and Co ions in ecosystems is undesirable. Our research in this area has produced environmental friendly iron (Fe) complexed azo and formazan dyes that maintain the desirable technical properties of the Cr- and Co-based prototypes. It was also found that the formation of low-spin rather than high-spin complexes is the key to overcoming the typically dull colors associated with Fe complexes (cf. Fig. 3). Fig. 3. Optimized geometries for low-spin (left) vs. high-spin (right) Fe complexed formazan dyes.